Say goodbye to the bottled flavourings and hello to the natural simplicities of wholesome fruit flavour, so simple, you'll have no excuse to make these! Going out I found myself feeling shocking after consuming so much processed sugar from the mass market alcoholic drinks, even the so called "healthier" versions still made me feel ill the next day, (most likely didn't practice one drink one water, now did I?) So I created these one day, using a blueberry and raspberry compote I make for my breakfasts at the beginning of the week, and I haven't looked back! Stick to one type of alcohol: As soon as you mix your spirits or what ever weapon of choice you have chosen, as soon as you mix, this can spike your sugar levels, as well as mix with what ever you have in your stomach, creating a not so nice sensation and concoction for your insides! Always go fresh: Swap up your sugary add ins for soda, or ask them to remove the sugar syrup, this will cut down the amount of liquid "fat" you are consuming from the alcohol itself as well as the added amount of synthetic flavourings they add to boost the taste! Adding a little fresh lemon or lime. Water Water Water: Want to limit the affects of your hang over the next day, for every drink or every two drinks, have a glass of water, this will help keep you hydrated as drinking does the opposite. Be mindful: Set yourself an intention, without going out and drinking aimlessly, until your that sloppy mess in the corner, or the one being sent home in a taxi (don't worry we've all been there), set yourself a limit, and tap in to where you are, why you are drinking, and how you want to be feeling the next day. Eat up buttercup! : Some of us think its cheating to eat.. don't be stupid we have to fuel to survive, to nourish and to give ourselves energy to make it through the day! Prep yourself with nourishing food to lessen the hangover the next day, as well as line your stomach before the alcohol takes over! But most of all enjoy your time, as a life lived in balance is a life well lived! Make ice cubes by place 2-3 lavender leaves + 2-3 blueberries in the holes of an empty ice cube tray, cover with filtered water and place in the freezer to set over night. To make the blueberry compote combine 1.5 cups of frozen or fresh blueberries, with all other ingredients into a small saucepan over a simmering heat. 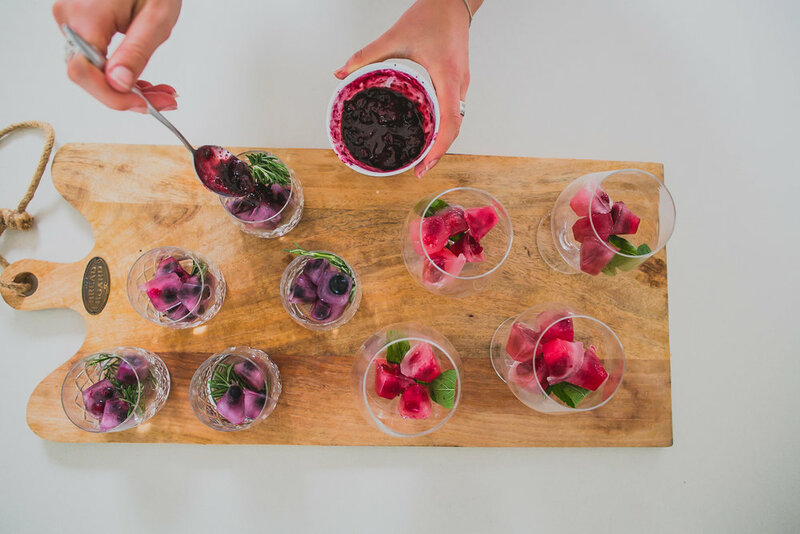 To assemble, add in the ice cubes, a few fresh blueberries plus a lashing of the compote, your spirit of choosing, then top with either Kombucha or Fresh Soda Water! Make ice cubes by placing 2-3 raspberries in the holes of an empty ice cube tray, cover with filtered water and place in the freezer to set over night. To make the raspberry compote combine 1.5 cups of frozen or fresh raspberries, with all other ingredients into a small saucepan over a simmering heat. Once the berries have been cooked through and stewed for around 3-4 minutes remove from the heat and mash with a fork, allow to cool slightly before stirring in the chia seeds, sit. 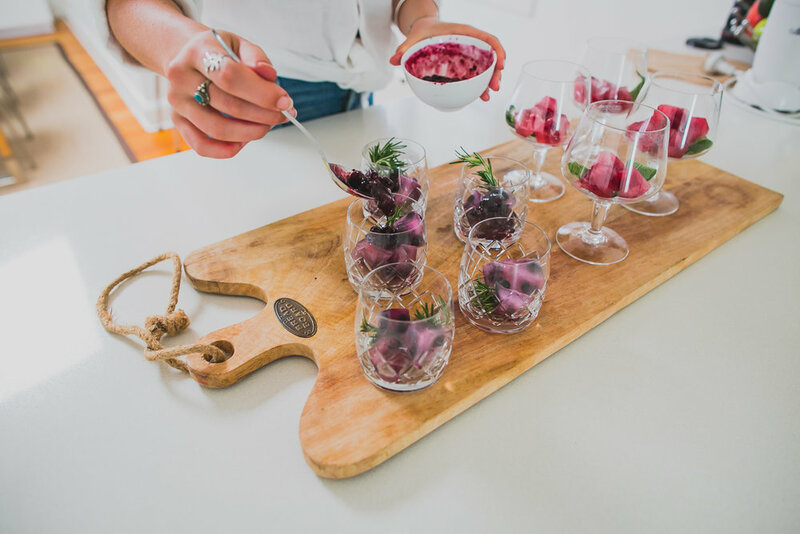 To assemble, add in the ice cubes, 3-4 fresh mint leaves, 1 lime wedge, some extra fresh raspberries, a lashing of the compote, your spirit of choosing, then top with either Kombucha or Fresh Soda Water!